The Royal Charter requires the Press Recognition Panel (PRP) to carry out cyclical reviews as soon as reasonably practicable two years after a regulator has been recognised and every three years after that. We can also carry out ad hoc reviews should the relevant circumstances arise. The Charter defines two requirements which both need to be met in order to provide sufficient justification for an ad hoc review. Schedule 2.8 provides that we may review a regulator at any time if we think that there are exceptional circumstances that make it necessary to do so, and that there is a significant public interest in a review being undertaken. This guidance has been informed by principles of Better Regulation. In order to undertake a cyclical review or an ad hoc review, we will require up-to-date information about the regulator’s performance since recognition, to help identify whether or not the recognition criteria continue to be met. by maintaining an active awareness of the regulatory landscape. We will establish means by which all interested parties can submit relevant information, in writing, online or by telephone. If interested parties have concerns or complaints about a specific publisher’s compliance with their regulator’s code of standards, these concerns or complaints should be raised directly with the publisher in the first instance. The PRP will consider concerns regarding a regulator’s compliance with all of the 29 of the Charter’s recognition criteria. It is important that any information submitted regarding such concerns is related to specific recognition criteria and we will provide assistance to enable those who contact us to do so. Wherever possible, we will share all relevant information we receive with the regulator it concerns. Information brought to our attention by parties who wish to remain anonymous may be useful and we will assess such material to determine whether it can be conveyed in a suitably redacted form. Before sharing such information, the party providing it will be given a chance to check whether they are content for it to be shared in the redacted form. Whenever a regulator makes modifications to aspects of its regulatory arrangements that are relevant to any of the recognition criteria, we encourage them to provide the PRP with this updated information. Publishers are well-placed to provide information in relation to certain criteria and such information from them would be useful to us. meeting stakeholders as part of our open-door policy. The reliability of sources of information is a key consideration and we will take steps to verify this. Among the factors influencing reliability will be whether the information is vexatious or frivolous in nature, and whether or not the information is corroborated by information from another related source. The reliability of information will have a bearing on how it is categorised and then assessed. Sharing information with the regulator will help us to confirm the veracity and degree of seriousness. Therefore, we will share information gathered with the regulator. However, if we receive information from a source who wishes to remain anonymous, we will only share information if it is possible to do so in an anonymised way with the permission of the informant. Information gathered will form the evidence base for our assessment for cyclical and ad hoc reviews. We will use a risk matrix to determine the appropriate response in each case. The risk matrix assesses the seriousness of the alleged breach, or variation, against the likelihood of compliance. Generally, the more serious the breach and the less likely it is for the regulator to put it right, the more severe it becomes on the traffic light system and the more likely it will be for the us to raise the issue at the next cyclical review, or to undertake an ad hoc review. Applying the likelihood of compliance to the level of seriousness to determine the appropriate threshold and the consequential PRP response. undertakings given by the regulator in breach of the criteria. Our decisions on the seriousness and likelihood of compliance will involve making judgements while deciding how to react to those judgments involves the exercise of discretion. The indicators provided are a guidance in relation to those things, and are not intended to be formulaic. Prior to coming to a view on seriousness or the likelihood of compliance, we examine the factors we think relevant to the circumstances under consideration. In response to a variation to how a regulator meets the recognition criteria, the PRP executive will make a judgement as to whether a call for information is required and, if so. the appropriate duration of the call for information. In exercising that judgement, the PRP executive will have regard to all relevant circumstances including the nature and extent of any consultation which the regulator has already undertaken. The PRP Board will ultimately decide if an ad hoc review is to be undertaken. The traffic light system indicated below is an output of the risk-matrix and provides a proportionate mechanism for determining the PRP’s appropriate response to an approved regulator who is alleged to be in breach of one or more of the 29 recognition criteria. The first stage of the cyclical review process will be a request from us asking a recognised regulator to assess themselves against the recognition criteria and to submit evidence to us to demonstrate that they are continuing to meet the Charter criteria. Regulators will be specifically required to identify areas of their arrangements that have changed since their original application for recognition. The PRP will then publish the regulator’s self-assessment to allow third parties to compare policies and processes established at the point of recognition to those in place at the time of the review. We will allow 20 working days for parties to comment on the regulator’s self-assessment. The regulator will then have 15 working days to respond to third party responses. A summary of the responses will be submitted by the PRP executive team to the PRP Board. We will then make an initial documentary review. If clarification or additional evidence is required, we will send a set of questions or a list of required evidence to the regulator and they will be given a reasonable period within which to respond. In addition to information sent by the regulator and third parties during the call for information, other information acquired by us may also be used. The PRP executive will meet the regulator to verify information acquired and to validate the evidence. The meeting will take place after the call for evidence period so that information from third parties can also be validated and verified. The PRP executive will then use the risk matrix to develop a draft Cyclical Review Outcome Report which, will contain recommendations to the PRP Board about the appropriate next steps. The draft Cyclical Review Outcome Report will be sent to the regulator who will have 15 working days to comment on factual accuracy. If the regulator disagrees with the assessment, the PRP executive will include the reasons for disagreement in the Cyclical Review Outcome Report before submitting it to the PRP Board. The PRP Board will meet to consider the information and the executive team’s Cyclical Review Outcome Report along with any comments on it from the regulator. The PRP Board alone will decide whether or not the regulator continues to meet the criteria. In addition to assessing whether the relevant regulator continues to meet the recognition criteria, the PRP Board is also required to consider the ‘fairness, effectiveness and sustainability’ of the regulator’s arbitral process. The aspects on which the Board may make suggestions include: recommendations about, or revisions to, the guidance and operation of criterion 22 (arbitration); directions to amend any small administration fee; and, the financial impact of the arbitral process on local and regional subscribers; with the power to allow recognition to continue on the basis that such subscribers can opt in, or out, of the regulator’s arbitral process. The Cyclical Review Outcome report will include a specific section addressing the PRP’s responsibility in respect of criterion 22 drawing from evidence gathered in the call for evidence. If a risk assessment indicates that there are sufficiently exceptional circumstances and significant public interest sufficient to justify carrying out an ad hoc review, we will give the regulator reasonable notice of our intention. In that notice, the reasons for undertaking the ad hoc review will be specified, and the notice period given will be determined by our view of urgency for the review. After notifying the regulator we will publicise more broadly that an ad hoc review will be taking place and we will clarify the recognition criterion or criteria that have triggered the requirement for the review. We will not prejudge the outcome of the review. A regulator will remain recognised until the PRP Board has completed the ad hoc review process. At the point of notifying a regulator of our intention to undertake an ad hoc review, we will submit a list of required information to the regulator. The permitted timescales for a regulator to submit a response to this request for information will depend on the severity of the circumstances that led to the issuing of the notice. Many of the recognition criteria are interlinked and where this is the case, the ad hoc review will also have to take those relevant related criteria into account. 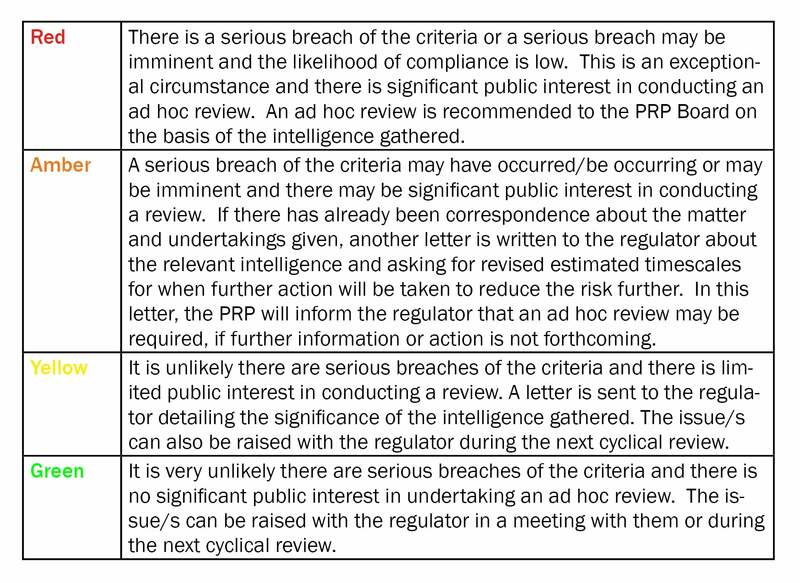 While undertaking a review, if more systemic breaches of the recognition criteria are uncovered, the PRP executive team may need to request additional information from the regulator. Most of the review will be desk-based, although the PRP executive may meet the regulator to verify certain information. These meetings may involve preliminary discussions, document reviews and interviews. The agenda of such meetings and any other relevant information required will be shared with the regulator in advance. Following the assessment stage, the PRP executive will prepare a draft Ad hoc Review Report. The report will include details of the issues under consideration and the recommended course of action. Regulators undergoing an Ad hoc review will be permitted a period to view the draft Ad Hoc Review Report prior to submission to the PRP Board, in order to comment on matters of factual accuracy. Any comments made by the regulator will be included in the final Ad Hoc Review Outcome Report before submission to the PRP Board for its decision. The PRP Board will meet to consider the Ad Hoc Review Outcome Report and to make a decision on whether or not to withdraw recognition from the regulator. After a review, we will publish our decision on the outcome of the review process. In the case of a cyclical review, this will include the PRP Board’s conclusion on the regulator’s compliance with the all the recognition criteria, including its conclusions on the fairness, effectiveness and sustainability of the regulator’s arbitral process. In the case of an ad hoc review, the conclusions will be limited to the specific criteria under consideration. The Board has insufficient information to determine whether or to what extent the regulator is meeting those criteria. Recognition may only be withdrawn if the PRP Board has given the regulator at least three months’ notice in writing of its proposal to do so. The Charter provides that this notice can be cancelled during that period. Where a regulator has not had its recognition withdrawn, the PRP executive may, where appropriate and with the consent of the regulator, provide feedback on areas where the regulator can improve its processes and arrangements.